The Elder-Scrolls video game series has been created by Bethesda Softworks and exists since 1994. After the franchise’s debut game “Arena” has been made, the compendium got advanced by fire more games. The most recent one is “The Elder Scrolls Online” but isn’t being produced by Bethesda. 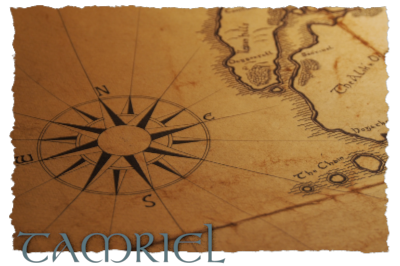 Each game of the Elder-Scrolls franchise takes place in the provinces of the continent Tamriel, a world on Planet Nirn. 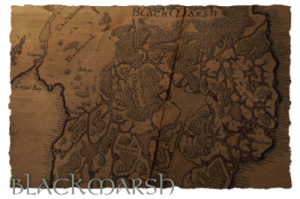 Throughout the last games, the provinces Skyrim, Cyrodiil and Morrowing have become very well known amongst the gamers but only represent a small part of the continent itself. With the Game “Arena”, Bethesda has released an official map containing all provinces with a plain representation of the land masses, borders and city locations. Later on, more detailed maps followed with the later game releases. Thanks to fan art and roleplay, many more versions of Tamriel have been released but are all full of contradictions and don’t coexist well with the Elder Scrolls lore. One thing they all have in common is the fact, that they are mostly computer generated or at least have been drawn on a computer. I had in mind to create a map of Tamriel with some sort of a historical touch and shouldn’t be created with the computer entirely. So I only had the opportunity left to draw it by hand. The size of the paper has been chosen to be approximately 80x60cm wide. It shouldn’t feel neither too big, nor too small. For some authenticity I have been using hand crafted paper and applied some aging effects to make it look more worn out. Like mentioned before, the map material do have a lot of contradictions amongst each other. I made myself clear, that I won’t stick to the lore. First I don’t know so well about it and in the end I would like to draw a map, that I like to look at and that every usual TES(The Elder Scrolls) gamer recognizes. So I have decided to take material from some official and unofficial maps, picked out the best references and added some of my own ideas. 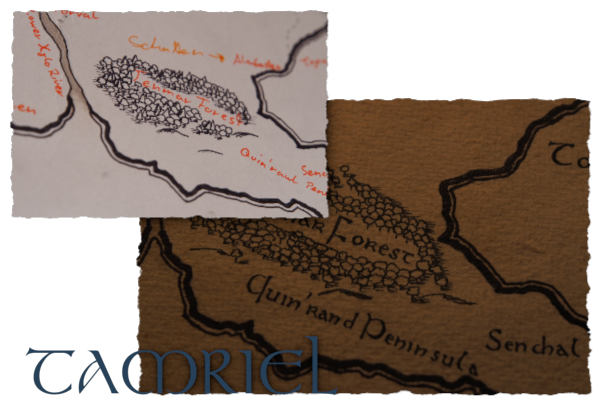 The drawing style is somewhere set between the Lord of the Rings Middle Earth map and that official one of Skyrim (TES V: Skyrim). For a precise projection onto the hand crafted paper, I first had to create the contour on the computer and print it out with a plotter. 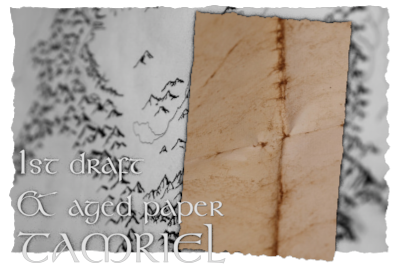 Now I had all the resources together like the hand crafted paper, the plot print and the map materials and so I’ve been ready to start. Before I started on the hand crafted paper, I made a drawing style test run on my print out. I had to get an idea about the line thickness and forms, get a feeling for the pens. In the first place I had in mind to use ink but I have realized that the ink will blend uncontrolled because of the hand crafted paper’s rough surface. As alternative I have used fine pens from 0.05-1mm thickness. 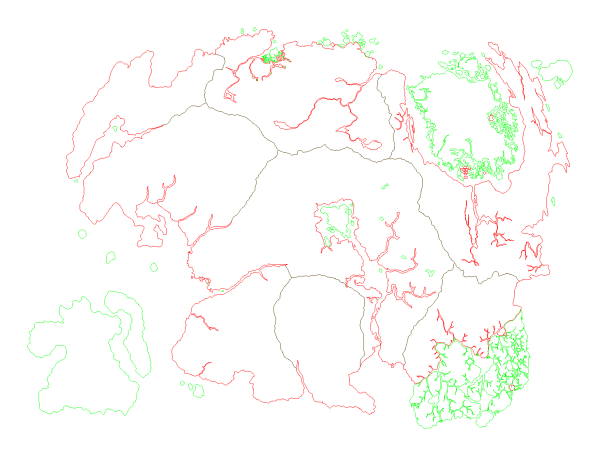 For the test run I draw along the coast lines, placed some mountains and made some labeling tests. I liked the drawing style, stopped the test run and started to project the contours onto the hand crafted paper simply with the easy method of using carbon-paper. Using that method won’t give you the final result for the lines as it just helps a orientation only. Using the carbon-paper needs much attention. It will result with stains once you move it over the rough surface or if you press onto it too much. After the projection, the whole work from the test run started over again. Drawing the coast lines and the mountains. Since the calligraphy won’t work, literally drawing the letters with the pen did the trick. Afterwards there were only the fine details missing such as trees and waves. I got asked once how many trees I have been drawing but honestly I don’t know and I probably will never count them. The final addition has been the sea rose on the western situated ocean. The map has been finished despite all its flaws. Who finds a mistake is free to keep it.